Ultraviolet stabilized color provides maximum resistance to fading. High density base creates low center of gravity for maximum stability. White cones can be stenciled and used for dressage arenas. We also offer our color cones in yellow, lime green, blue and orange. Reflective cone collars and stenciling are available at additional cost. Please call or email for details. 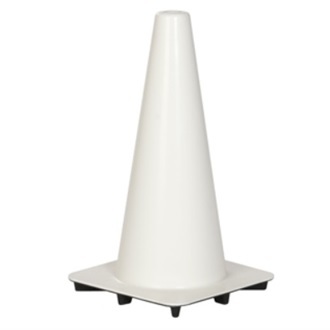 Go to top of this 18 inch White PVC Traffic Cones, Case of 20, $8.50 ea page.